Would you buy such a uATX case? The main feature of the concept is the *slats intake*, which has been presented before, and MikeC said 'nice idea'. But this time it's a bottom intake with a very large dust filter above it, unlike the NSK3480, which lets dust in through 4-5 intakes. As for sizes, it's 5 cm taller than the NSK3480, same width and depth. It allows only one slim optical drive, I agree that's a drawback. The PSU controls the case fan, which could be a 1,200 rpm Slipstream. Upto 50W it should stay at 600 rpm and ramp up linearly with wattage. So 700 rpm for 100W, 800 for 150W, 900 for 200W, 1000 for 250W, 1100 for 300W. So at full 300W it should provide ~60 cfm (enough?). The space for the vertically mounted HDDs would only allow upto 2 because it overlaps with the motherboard. A good VGA cooling feature is that the passive AC S1 would get a lot of airflow, more than in a Solo or P182. A possible variation would be to use a standard sized (slot-loading?) optical drive mounted sideways, to save 1 cm height and use the front space. Your thoughts, please? If the poll shows many people would buy it, maybe someone will manufacture this case. The issue I see is that, because it's a negative pressure case, it would have to be very well sealed to make sure dust wouldn't bypass the filter. Not easy to do, specially the I/O shield plate, because that's something that can only be done by the end-user after he installs the motherboard. Unless you thought of that and have a good solution for it? How would the filter be removed for cleaning? Would it slide out the front without having to open the case? That would be best I think. Good points, Shaman. I haven't considered the I/O shielding issue, but compared with the unfiltered intakes in a NSK3480 IMO it wouldn't matter. Since the 12 cm fan is so close it would spit the dust out immediately. But a silicone gasket preapplied on the shield should seal it when mounted. The very large bottom filter could slide through the front, but that would mean more contact surface with the case and more friction when sliding. So I believe it would be better to have it slide sideways, it would have less chances to get jammed. I agree that turning the case on its right side and accessing the filter after removing the 'slats intake' would be bothersome. You've seen this latest project of mine....with the slide-out filter? The filter slides out from either side. The fans are right above it, blowing into the case. If you put the fan at the top of the case blowing outward, the setup would work pretty much the same, but dust would enter many places, bypassing the filter. You cannot avoid it....believe me, I've tried. Positive pressure is the only way to go, if you're trying to avoid dust. I think you could seal it, so no dust can enter. That's not the issue though, the real issue is that you can't have a power hungry system, especially a hot video card (8800gt? ), because the heat will rise up (psu->gpu->cpu), so it's not good. But for a htpc system, it should work ok. I wouldn't buy it. Because of the bottom intake, you've got a lot of chance a lot of dust will build up in the filter. Very fast. Same problem occured with the Nexus Breeze. The idea of he case is good, bottom intake, outtake through the PSU. Problem, lots of dust build up. I always fair the same problem with other cases that have the same airflow path. So: no, I wouldn't buy it, because I'm too lazy to clean the filter often. That's exactly why the filter should be as easy to remove as possible. The easiest possible way is to pull it from the front. From the sides, well many people have their computer in a confined space, like between the desk and the wall, that just delays the cleaning. But almost everyone has enough clearance in front of the case to pull a big filter out. Tzupy, check this video review of the Lian Li Armoursuit and see the huge filter that slides out in one piece, ok it's on the door and slides out from the top but it's much bigger than the filter in your concept and has no problem sliding out. How about a dust filter that senses when it is too clogged and fires off an annoying beeping sound with a flashing red light to remind the user to stop being lazy. @Bluefront: I hadn't seen that project of yours yet, but thank you for showing it here. You know, it's not easy to keep track of your many projects. This very design is in part inspired by your projects, so keep up the good work! About the positive pressure issue: I doubt this kind of design would be able to cool PSU, HDDs, GPU and CPU with a single fan with positive pressure. And putting the fan(s) on the bottom would have further increased the height of the design, which is already 5 cm taller than the NSK3480. @DG: this setup should be able to cool a 8800GT with AC S1, but you are right that the CPU (passively cooled) would get toasty. For a system with E8400 & 8800GT, at stock clocks, the maximum power would be around 160W, which would result in 25W of heat from an 85% efficient PSU. But since the airflow would be directed straight towards the S1, better than in a P150 for example, it should cool it adequately. For a HTPC using a BE2400 on the new 780 (integrated graphics) based uATX mobo, this design should work not just 'ok', but great. You'd only need to duct the Ninja (or HR-01) to the fan, because Skt AM2 CPU positions are further away from the fan than Skt 775. @Shaman: of course a front sliding filter can be well built, but who can guarantee that whoever would manufacture this concept will do it right? Remember the issues with the P180 door? Hinting at Antec as a possible manufacturer of this design. Putting the mobo upside down would mean to have the PCI slots and I/O shielding facing the front of the case, but still inside the case. This is uncharted territory, I doubt any case seller will do that. But such a configuration would allow 2 x 120 mm fans in the back (or even 2 x 140 mm). Of course in this case the S1 would be useless, you'd need the a gfx cooler that wraps around the card, like the HR-03. Errr, i don't get it. Why the IO shield would be facing the front of the case? 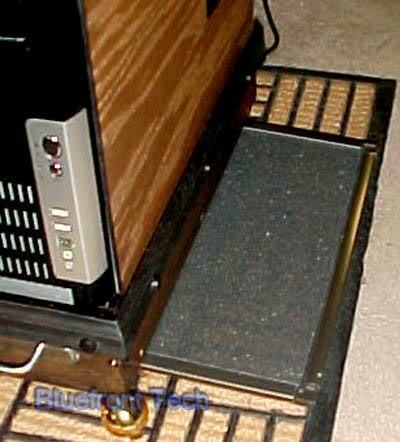 Look at some cases with an upside down mobo, the best example would be the Lian Li A05. Anyway, i don't think any of this setups would work with a 8800GT card, because of the heat. The 120 fan would not be efficient at a low speed, imo. I think you mean with the mobo mounted on the left side of the case, not the RIGHT side (this is also a joke about driving in the UK). The fan would be positioned much lower (10-12 cm) so while the CPU would get relatively cool air, the GPU wouldn't get enough airflow IMO. Not to mention that all other potential PCI cards positioned above the GPU wouldn't get any airflow either (airflow path is shorter). If we'd have a S1W, meaning a S1 that wraps around, like the HR-03, then it might work for an 8800GT. Anyway, ths S1 it's not good for this setup, that's why the TR HR03 is better. The pci card wouldn't need any cooling (sound card, tv tuner, etc), but the southbridge on some mobos would need some airflow. Also, the chips on the back of the video card (vrm, mosfets, etc), would need some airflow. So...it' tricky. Since there was an issue with the CPU getting significant heat from the other components, I updated the design with a front intake, filter, and CPU duct. I know it's not the pure bottom intake design anymore, but I couldn't duct the CPU otherwise, without changing the position of other components. The total intake area should be over 200cm2 (the front slats aren't on the sides of the case, but 15x8 cm on the front), which raises the question if one Slipstream is enough. A possible upgrade would be to add 2-3 cm height for a top exhausting Slipstream, similar to the P182 setup (that would allow for a full size optical drive too). Hmm, IMO this would be clearly better than a mini P180. And yet many people are going to buy the mini P180. I don't think you should compare your concept case with a case that fits 3x 5.25" drives and 5x 3.5" drives. Well, how many SPCR people want a uATX that can accomodate 3 x 5.25" & 5 x 3.5" drives? I bet most would be satisfied (for a uATX) with 1 x 5.25" & 2 x 3.5". I'd use this design for a portable mini workstation. And I meant 'better than mini P180' regarding the airflow, with 2 fans installed (extra top fan), because the intakes would be larger than in mini P180.